There is the story of the two campers whose tent is about to be invaded by a hungry bear. 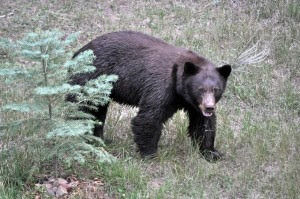 Despite both knowing that a bear can outrun a human, when one camper noted that the other was putting on his running shoes and tightening the shoe laces, the camper asked the other "why are you doing that?" The other camper responded "I don't have to outrun the bear, I just have to outrun you!" I think there are a lot of times in medicine when doctors are faced with the task of simply doing their best under the circumstances. It is not that they are necessarily wholly incompetent, it is just that diseases, not the doctors, can have a way of controlling the outcome of the illness. Physicians faced with such diseases in their patients such as cancers and other illnesses may rarely want to give up. They may decide to continue specific treatments to rid the disease, denying the obvious that the disease is overtaking the treatment. Sometimes the patient or families encourage the physician in this regard. This is not at all an uncommon scenario presented to hospital ethics committees for consultation. There should be a time, however, when the doctor realizes and accepts the inevitable and begins approaches which are the best treatment and benefit for the patient under the circumstances. This may involve energetic palliative care, care to relieve suffering but treatment that no longer attempts to cure. One cannot always think that doctors can outrun the inevitable but, like the camper, must find alternate ways to accomplish the best under the circumstances. Any objection from my visitors? ..Maurice. Graphic: Hungry Bear from KRQE.com via Google Images. IVF Ethics: Should an Embryo be Rejected Because It's Potentially "Sick"? The more science provides folks techniques to manage infertility such as through invitro fertilization and then implantation and the more science also provides tools to determine before the embryo is implanted whether or not the embryo is "potentially sick" because it is carrying a serious genetic defect (preimplantation genetic diagnosis), society is faced with further ethical and legal dilemmas. Such a dilemma can be developed from the example above: should prospective parents who desire to have a child by undergoing invitro fertilization be required under law to first have their embryo diagnosed for a genetic defect and if a serious genetic defect is found, they be compelled to reject implantation? Could it be argued that such attempt at diagnosis and subsequent rejection be considered under law and ethics as in the potential child's "best interest"? And, perhaps in the best interest of the future generations if this embryo was allowed to mature, be born and survive long enough to have its own children? On the other hand, is the general ethical and legal principle of parents "acting in the best interest of their child does not mean choosing the 'best child'"? The expression in quotes is the title of a rebuttal by L.S.Flicker in response to a view set by Malek and Daar discussed in the current April 2012 issue of American Journal of Bioethics. But what is your thought on this subject? ..Maurice. Does End-of-Life, Hospice, Comfort Care Represent "Murder, Euthanasia, Killing"? Surprisingly, after over 30 years of hospice care available for those who are terminally ill, the public and even physicians have interpreted end-of-life care, hospice and comfort care patient treatment as "murder, euthanasia and killing", Palliative medicine, treatment to relieve pain and discomfort, in patients who have no further treatment to resolve their disease is an established certified sub-specialty and yet physicians who perform this specialty are working under a cloud of such misperceptions. Read about this issue in Amednews (American Medical Association News). Do you look at treatment by physicians, with the terminally ill patient's consent, to relieve the pain and suffering "murder, euthanasia or killing" just because the patient's life might be ended a bit sooner than if they were left untreated? Or might you look at pain unrelieved by the treatment of a doctor as "torture"? ..Maurice. Spending A Lot of Money on Your Sick Dog or Cat: Is that Ethical? From today's New York Times Opinion page: "Veterinary medicine has made big leaps in recent years, which is great news for ailing dogs and cats — but raises some tough questions for humans. 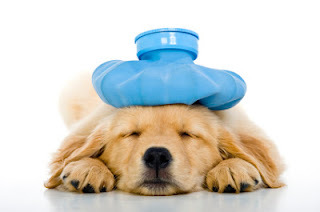 With the availability of treatments like bone-marrow transplants and heart stents, it is now easy to spend $10,000 to $25,000 on medical procedures for a pet. Knowing that many humans die of preventable illnesses, or even considering that many dogs and cats are euthanized in overcrowded animal shelters, can a person justify spending that much money to prolong one animal’s life? If so, is it ethical to have a pet if you cannot afford such treatments?" I would add, "...and even if you could afford it, is it in the best interest of humans who could benefit from the money for its use in research and treatment of human diseases? Is there a point where the life of a pet cat or dog becomes of less value than preserving the life and existence of it's owner or other humans in general? "When our 6-year-old Labrador was dying, the vet said, “There’s nothing we can do.” We weren’t prepared to give up so easily." "Even if a treatment option is promising, people must consider the cost and caregiving burdens." "When you acquire a pet, you sign up to care for it for the duration of its life — but not 'at any cost.'" "The first question is: Will the procedure improve the quality of life for the pet, or prolong suffering?" "Spending $10,000 on chemotherapy for your golden retriever is no more unethical than spending it on a two-week vacation in Tuscany." "There is no shame in euthanizing a pet, if it is done out of love. Nor is there shame in spending money to prolong a pet's life." Come back and write your opinions here. ..Maurice. 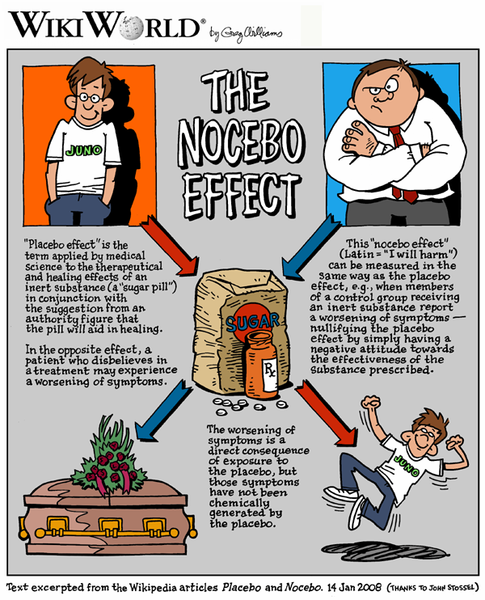 How Much Truth Should the Doctor Tell the Patient in View of the NOCEBO EFFECT? "In medicine, a nocebo reaction or response refers to harmful, unpleasant, or undesirable effects a subject manifests after receiving an inert dummy drug or placebo. Nocebo responses are not chemically generated and are due only to the subject's pessimistic belief and expectation that the inert drug will produce negative consequences." It has been through research using placebos to establish that such a negative reaction exists. The real clinical and ethical importance of such a concept is with regard to informed patient consent with regard to potential medicine side-effects or in presenting to the patient a full description of the complications of any form of treatment. The principle of informed consent obligates physicians to explain possible side effects when prescribing medications. This disclosure may itself induce adverse effects through expectancy mechanisms known as nocebo effects, contradicting the principle of nonmaleficence. Rigorous research suggests that providing patients with a detailed enumeration of every possible adverse event—especially subjective self-appraised symptoms—can actually increase side effects. Describing one version of what might happen (clinical “facts”) may actually create outcomes that are different from what would have happened without this information (another version of “facts”). This essay argues that the perceived tension between balancing informed consent with nonmaleficence might be resolved by recognizing that adverse effects have no clear black or white “truth.” This essay suggests a pragmatic approach for providers to minimize nocebo responses while still maintaining patient autonomy through “contextualized informed consent,” which takes into account possible side effects, the patient being treated, and the particular diagnosis involved. How much of the "good news" of a drug or other treatment or disease prognosis and how much of the "bad news", that is, side-effects of the drug, complications of the surgery or other procedures or disease outcomes (in view of the documented "nocebo effect" ) would you want to know from your doctor? For those who want to read more on the issue "Is It OK for the Doctors to Lie?" go to my earlier thread on the topic and take a quiz about lying if you were the doctor in various situations. ..Maurice. Graphic: From the Wikipedia article. In addition, he suggests voluntary vital organ procurement for donation, an act that would end the patient's life at a time when the process of Natural Dying has become clearly irreversible, while waiting for the patient to die would result in damaging the organs so they could no longer be gifts of life.Even though Dr. Terman’s suggestion may provoke some ethical or legal challenges, both he and I think it would be useful to obtain some feedback from people from a variety of backgrounds who may face such decisions on a personal level. (I personally have not as yet taken a position about it.) Dr. Terman tells me that we can expect his responses to your comments here. This issue is important enough that this suggestion and the link to Caring Advocates be offered to public for the purpose of furthering discussion. So here it is on my bioethics blog for my visitors’ consideration and discussion. ..Maurice. When asked by the Mayor of the Munchkins about the Wicked Witch of the East (on whom Dorothy’s house fell), the local Coroner answered: She is “morally, ethically, spiritually, physically, absolutely, positively, undeniably and reliably…” as well as “really and sincerely” dead. [L. Frank Baum’s, The Wizard of Oz, 1900.] Back then in “Oz,” death simply meant the cessation of heart and lung functioning. Today, modern medical technology can prolong a person’s biologic existence after major organs are so diseased they cannot function on their own, without “life-support” or “life-sustaining treatment.” The result has led to choices and conflict about which Mr. Baum could never have dreamed. Since 1968, we have been abiding by an ethical concept called the “Dead Donor Rule.” This means that physicians will never harvest organs from live patients. The political purpose of this rule is to give people confidence that if they cannot speak for themselves, others will not give up on them because they want to harvest their organs. Clinically, however, some physicians and ethicists consider it a fiction that patients are really “dead” by definition. They point out many ways in which such patients are still alive, although very sick, absolutely unconscious, and totally dependent on machines to remain… (yes, alive). Others argue that the neurological criteria for “brain dead” are sound in one important sense: clinical experience shows that patients who fail the test never regain consciousness. Suppose there is a way for you to decide, to describe, and to memorialize your own criteria so that others will know at what point you would NOT want life-sustaining treatment, and would therefore be willing to die? In that case, it would be YOU -- not a state, or an institute, or a hospital (which could change its definition between now and when you become unconscious and reach this end-stage disease) -- that would determine when you would let nature takes it course so that you could die and before that, donate your organs. Question 1: Would you have more confidence in your own criteria, or would you rather depend on the potentially changing criteria that others will have established, when “that time” comes? The living will that determines “WHEN” can importantly choose a way to die called “Natural Dying.” This means to stop not only stopping all life-sustaining treatment including tube feeding but also assisted feeding and assisted drinking. Of course, you would always receive all the comfort care you would need to die peacefully by medical dehydration. This includes agents to reduce your thirst. (Hunger is rarely a problem.) Most people die within two weeks. Question 2: Can you imagine conditions such as untreatable, unbearable pain and suffering, or advanced dementia, or a permanent coma -- where you would opt for “Natural Dying”? Now suppose your medical condition reached the state where you were ready for “Natural Dying,” and that, as a completely independent decision, you also decided to donate your organs. Question 5: Overall, which set of criteria would you be more comfortable with: one established by a state, or institute or hospital… or one that you decided for yourself? Question 6: If someone suggested that your consent to donate organs when you reach your own criteria for “Natural Dying” violates the “Dead Donor Rule,” would you agree or disagree? Could you offer an argument to support your view? Question 7: If someone suggested that your consent to donate organs when you reach your own criteria for “Natural Dying” is a form of euthanasia, would you agree or disagree? Could you offer an argument to support your view? Question 8: Do you have any other comments or questions? A physician interviewing or examining a patient may find him/herself in a professional clinical situation that the doctor had not experienced previously or even thought about and at once must decide how to respond to the situation in a manner which is ethical and professional and hopefully constructive and even of therapeutic value. I have challenged my second year medical students to a discussion about how they would handle each of the four clinical situations listed below. Now I would like to challenge my blog visitors to do the same. Pretend that you are the doctor of the scenario and suddenly faced the patient's response. What would you do next? ..Maurice. 1) You ask the father of a child patient whether there are guns in the household and the father becomes angry and says "it's none of your business!" 2) You are a male physician and your female patient of a few visits now says "I have taken a liking to you. Can we go out tonight together for supper." 3) You are trying to take the patient's medical history and the patient repeatedly returns to talking about different symptoms which his cousin is experiencing. 4) You are attempting to perform a physical exam on a young but adult patient and every time you touch the patient, the patient is repeatedly squirming around and giggling and responding "I'm very ticklish." Doctors "Should Do No Harm" but How About Carrying a Gun? Is there any profession which is so dedicated to non-violence and "to do no harm" to others and particularly to those they serve? I am thinking about a priest or reverend or rabbi or others supporting their God. I am also thinking about a physician. I found an interesting website (Brainblogger) and article regarding doctors and their access to guns either within or outside their office. There are also present a number of visitor comments and it seems that the majority find acceptance with regard to doctors having guns for self-protection and protection of their offices. But, what about the professional ethics of carrying a gun with the intent to shoot and most likely kill someone as a response to a threat to ones own life? Should doctors have some higher duty "to do no harm" if such harm could be prevented by not having a gun readily available? ..Maurice. p.s. On the other hand. Here is another view of doctors and guns which has been seen on various websites but I don't vouch for all the statistics presented. However, I guess there are different ways of looking at the doctors and guns issue. (B) Accidental deaths caused by Physicians per year are 120,000..
(C) Accidental deaths per physician is 0.171 (17%). Statistics courtesy of the F.B.I. P.S. - Out of concern for the public at large, I have withheld the statistics on lawyers for fear the shock would cause people to panic and seek medical attention. What is the Difference Between What is "Good" and What is "Bad"? Perhaps, since what is a "good" for one person may be a "bad" for another, perhaps the question why should society bother to distinguish the "good" from the "bad" in the first place? Is it essential for society to define the differences in order to set standards acceptable to society with regard to individual behavior to prevent chaos: a conflict between persons who find one behavior to be acceptable and the other persons who find it unacceptable? And yet, one might wonder whether society, perhaps through political decisions and laws, are setting too many standards, too many decisions as to what is good and what is bad, perhaps more than what is really needed. Actually, I shouldn't be blaming society in general since each individual in society may live their life with their own stereotypes of other's behavior or their own life experiences or possibilities as either good or bad. And these stereotypes may not be based on facts but more on feelings or moral beliefs. What do you think? ..Maurice. In the past 8 years, I have covered many, many topics regarding bioethics, ethics in general and ethics specifically as related to medical education and medical practice and I have many, many visitors who have contributed to the threads I have developed. But, still, there may be a host of topics which I have not considered and which has troubled some visitor. On this thread, I would like to hear about those topics which could be further developed or started as new. Google's Knol, a site where I was attempting to answer the ethics concerns of visitors there over the last few years is now being dismantled by Google. So, let's hear from you here if you have an idea or question. ..Maurice.